Very cool, and good work. But i’d like to see the need for the computer removed in a future version. 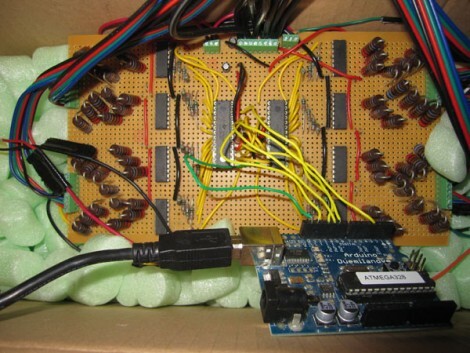 You’ve offloaded the PWM to dedicated chips, and the audio processing to a computer, what’s left for the Arduino to do? Just translating? I did something similar with my RGB Fan Controller, used a Processing script to flash the LED’s to music. Using a 20MHz ATMega168 and interrupts I was also able to get 24 channels of 256-level software PWM out of 3 basic shift registers chained together to drive 8 RGB LED’s. I may have to look at this Processing script because the LED fading looks much nicer than what I was getting. Nice hack… love the perf board! Schematic? Possible brief explanation of the 4 ULN2004’s? @ CalcProgrammer1, I would also be interested in seeing a schematic for your project as well. The TLC5940s use I2C, the computer uses a RS-232 serial port. It looks like the Arduino is just listening for commands on one then repeating them on the other. Yeah, I figured, I was being somewhat rhetorical in the first post; trying to get the point across that the Arduino is hardly being used. the tlc5940s use a serial interface but its not i2c. and they need a few other lines to control the pwm clocking and resetting. kudos for getting that figured out. why not a max7313 instead? yeah mate im doing my major project for year 12 anychance i get get the schematic on this it would be an awesome project!